1 – Context is Everything. Context is everything. To be irritated by something, or to not be irritated by it, comes down to the context. A driver cuts you up and jumps an orange light – irritating. A driver cuts you up, jumps an orange light, turns quickly into the hospital car park and dashes into A&E with her sick baby – not so irritating. Kids shouting in the street after bedtime – irritating. Church bells at night – irritating. Dogs barking outside – irritating. 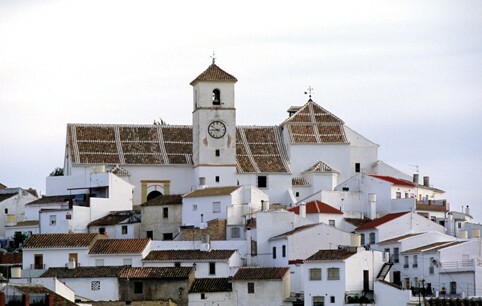 As I lay in bed in my first night in my own little corner of Andalucían paradise, I listened to the children (and adults) shouting, the bells pealing and the dogs barking. Despite the steepness of my little dead-end road, the family just above me were sitting precariously outside their house, eight of them on wobbly plastic patio chairs, laughing and chatting sociably at 10.45pm, the children racing up and down the cobbled hill still joining in the conversations – calling back up to their grandparents from the bottom of the slope. I’d introduced myself on my return half an hour before, and the smallest child, maybe about six years old, had given me a beautiful smile. My evening was ending early for Spain, tired from the excitement of signing contracts at the Notaría and moving in, all I wanted was a cup of tea and to try out my bed. Theirs was just beginning – a long sociable chat in the cool of the evening air. 11pm and the church bells chimed – that lovely clanking sound of ancient iron bells from a whitewashed tower. 11.03pm and the bells from the town hall followed – a higher note and a different rhythm. 11.07pm and the Ermita brought up the rear, the sound of their bells travelling clearly through the night air from their viewpoint high at the top of the hill-town. No coming together of church and state here, at least as far as the bells are concerned. As the dog barked and the bells pealed and the children shouted and the adults laughed, I tried to remember what I’d read in John Hooper’s excellent book “The New Spaniards” – an insightful analysis of Spanish culture, the country’s rapid (and comparatively recent) transition to a modern democracy, and the people’s complex use of private space and public space. Did I remember it all? No. Was I irritated by the sounds of Colmenar surrounding my new home? No. Did I find out whether the church bells pealed again at 11.30? No. As I struggled to recall the detail of how history and climate have shaped culture and behaviour, the sounds and the context of Spain, Andalucía, and Colmenar circled my house, drifted in through the open windows, curled around my pillows and into my sleepy brain, and I slept. We lived in Andalucia for six years, the last three years on a finca near Alhaurin El Grande. There are many irritants about Spanish life. Personally I think they are outwieghed by the positives. Keep the blog coming, I shall be a regular reader. Hasta Luego. Tamara – I didn’t know you were such a gifted writer. Great. Do keep us updated. Best of Luck. Malcolm Pitcher, MSP Business Services. Context is everything – so so true. Thanks for visiting my blog Tamara, I meant to return the compliment and like so many times these days time rushes by and then I forget! Well done on getting photos up, another hurdle over and always another one ahead. I hope you´re settling in. I have only discovered these writings and will enjoy updating myself during the long English winter I am forced to endure – Thank you.